Broaden your competitive advantage by improving your companies reputation, prestige and credibility. Select from our tangible and strategic ways to reach your target market and support the Southern Saratoga County community. This support is critical and makes possible the many Chamber programs designed to support and strengthen small businesses and entrepreneurship in Southern Saratoga County. This dinner affair celebrates the many accomplishments of the previous year and sets the standard for future success. Attended by hundreds of Southern Saratoga County’s finest, this gala serves as an opportunity to honor those that have made significant contributions to enhance our quality of life, make Southern Saratoga County a better place to live, improve our education, medical and public service communities. Held at the Hall of Springs, this event is the Chamber’s largest networking and social event of the year. Audience: Average attendance of nearly 400 government officials, community and business leaders ranging from small to large companies across a number of industries. Southern Saratoga County’s largest monthly networking event. Held at various locations ten times annually with the region’s entrepreneurs, business and community leaders. It is the perfect event to generate exposure for your company. Sponsorship opportunity include Mixer Table Sponsorships whereby the company can include a display and have an opportunity to address attendees. Audience: Average attendance of 100 community and business leaders ranging from small to large companies across a number of industries. 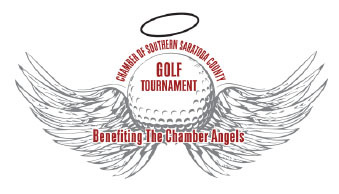 Known as one of the best golf tournaments in Southern Saratoga County, the Chamber’s Annual Golf Tournament provides members an opportunity to enjoy a day on the links with business friends, clients or prospects. Held at The Edison Club, one of the region’s finest private golf club, this scramble tournament includes a putting contest, longest drive and closest to the pin contests, hole-in-one prizes, great raffle items and a terrific cocktails and awards reception afterwards. Partial Proceeds. Money raised at the silent auction will benefit he Southern Saratoga Chamber Angels, Inc. to fund the holiday gift list fulfillment of children from families in financial distress in our community. Audience: Average attendance of 150 which in-cludes 132 golfers plus hole sponsors and other guests. This group’s mission is to provide an environment to empower, educate and enrich the professional and personal lives of women who work and live in the Southern Saratoga County region. The Women in Business Committee includes 75 professionals that support Wellspring throughout the year. Donations are accepted at all Women in Business Events that are used for inclusion in Baskets of Hope and Backpacks of Hope program to benefit the women and children who are victims of domestic violence. 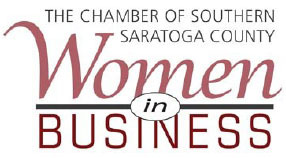 Audience: Average attendance of 50 of the most influential female entrepreneurs, business and community leaders in Southern Saratoga County. 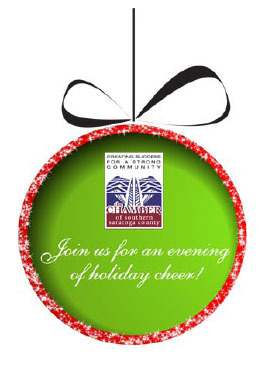 Southern Saratoga County's Holiday celebration held on the 2nd Thursday of December includes networking with the Chamber Board of Directors, and 200+ member business-es. Take advantage of the opportunity to showcase your business and recognize the achievement of the Chamber Angels and community development program. Audience: Average attendance of 200 community and business leaders ranging from small to large companies across a number of industries.